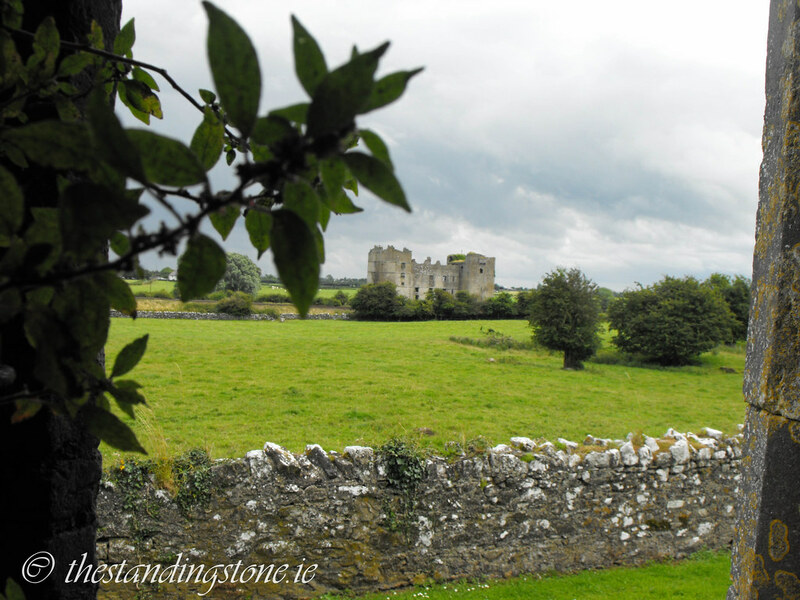 The Standing Stone: Loughmoe Castle, Loughmore, Co. Tipperary. Loughmoe Castle, Loughmore, Co. Tipperary. 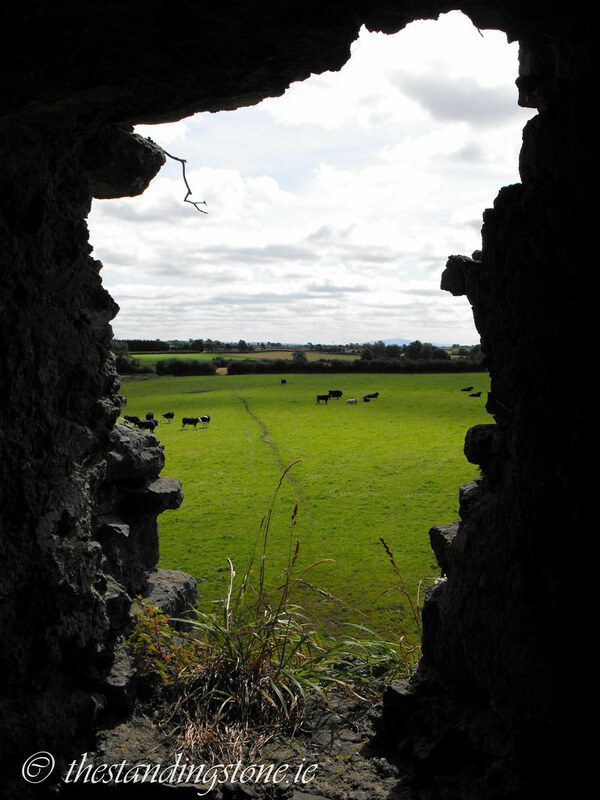 Location – In the village of Loughmore, near Templemore in Tipperary. 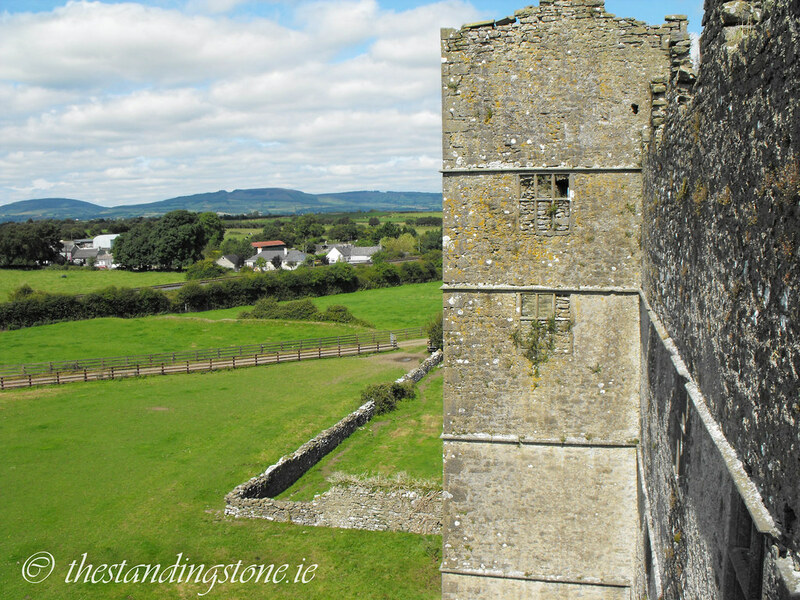 Description and History – This castle is really one of the best I have ever been to. It is simply fantastic and one of the places that I receive the most emails about. It is huge and dominates the surrounding landscape. You could really spend house here. 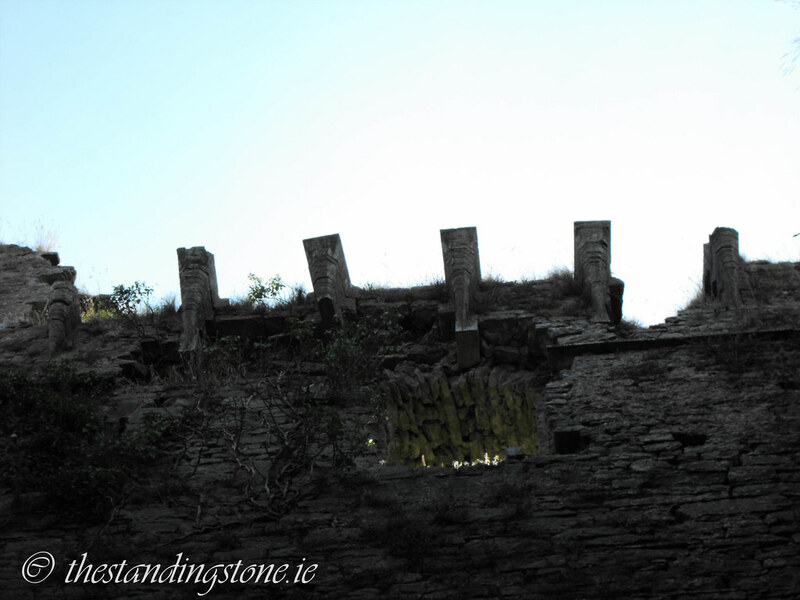 It is situated between the railway line and the river Suir. Although the building looks like one huge castle it is actually a 15th century tower house to which a 17th century fortified house has been built on to which makes it look like an H plan house. 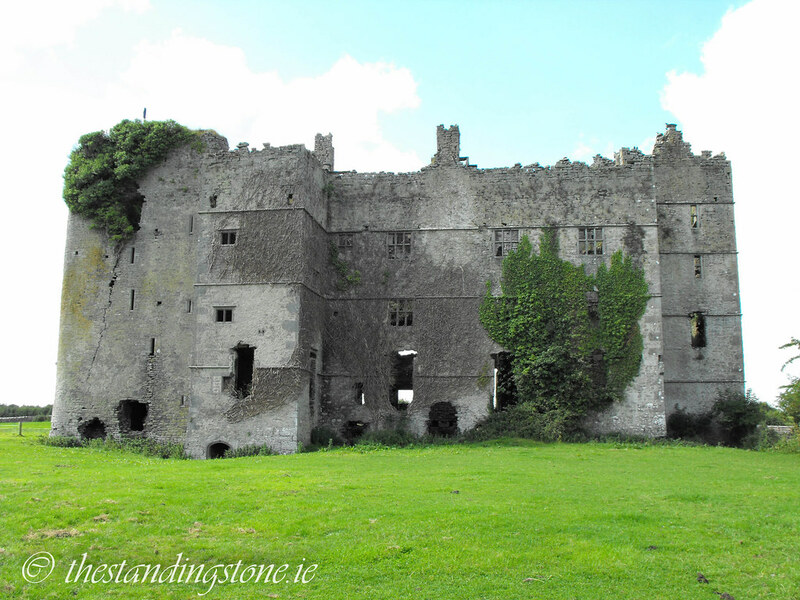 The house was the seat of the Purcell and Butler families and home of the Barony of Loughmoe. The Purcells were an Anglo-Irish family who originally arrived in Ireland during the Norman invasion in the 12th century. The presence of the Butlers was because of inter-marriage between the two families. The Purcells sided with James II during the Williamite War and Nicholas Purcell fought in the battles of the Boyle and Aughrim and signed the Treaty of Limerick. He did not flee Ireland with the other “Wild Geese” following the end of the war and chose to remain in Ireland to fight for Catholic rights. The 17th century portion of the house is completely gutted. The newer tower portion is 5 storeys high while the central portion of the house is 4 storeys high with a semi-basement. The basement floor is now missing but the level of the floor can still be made out. The tower house is much modified to be in keeping with the later 17th century portion but can be clearly identified with its rounded corners, gun loops and machicolations. Unlike its corresponding tower it is 4 storeys high, although the semi-basement is also missing. The third floor (now second) contains an elaborate fireplace containing coats of arms and initials of former residents. Side chambers are easily accessible. The fourth floor (now third) was the former attic but the wooden roof is now missing. A huge chunk of the wall now lies in the middle of the floor and it is overgrown. There is a hidden prison chamber on the top floor but I wouldn't recommend going in there. You have to drop down from above and there's no guarantee that you would get back out again...especially on your own. 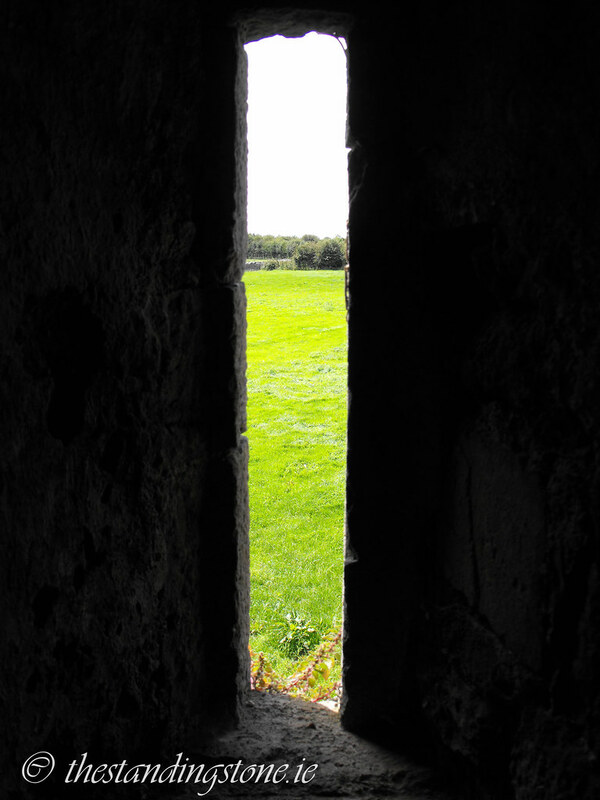 Difficulty – Access is through a farmyard and as always it is better to ask (if you can find the owner), but I have read that the farmer is use to and welcomes visitors to the castle. A short walk from the farm yard brings you to the castle which is situated on well drained land. 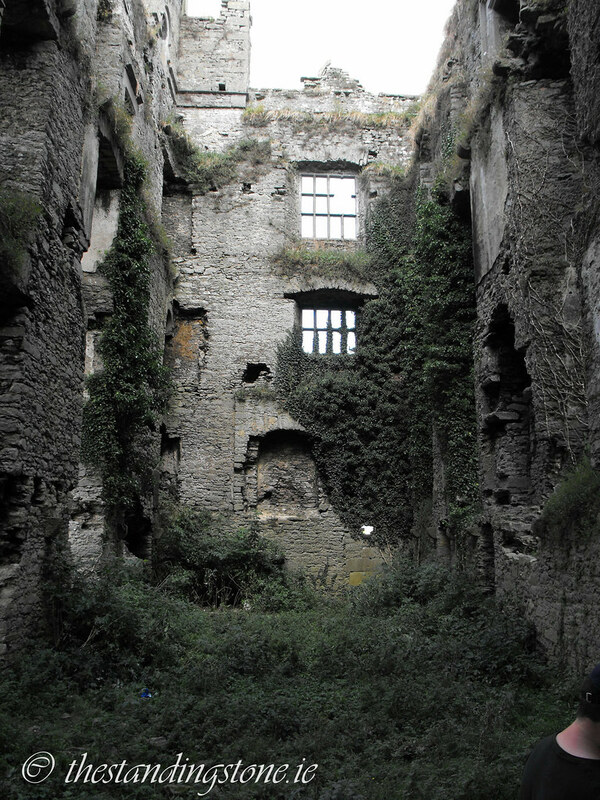 The interior of the castle is uneven due to rubble and weeds. An attempt has been made to block up the stairwell but this has been knocked over. The upper floors appear to be safe, but I am no structural engineer. The fallen portion of the wall onto the upper floor may have weakened the floor but it appeared to be sturdy (although there were a couple of hollow sounding bits). Be careful on the stairs – they are dark and narrow with much debris making climbing difficult, especially for those who have big feet like me. For more castles, click here. 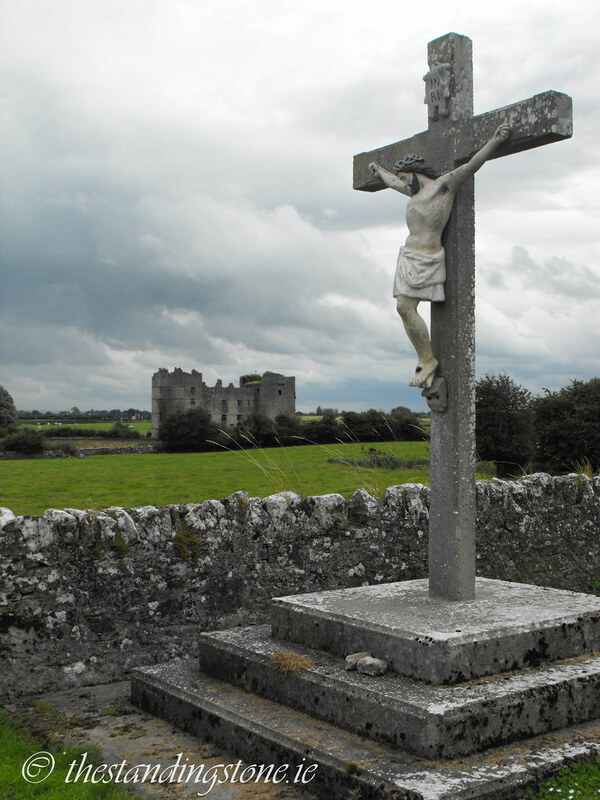 For more sites in Co. Tipperary, click here. As viewed from the nearby grave-yard. This is the original tower house portion of the castle. Inside the gutted fortified house. There are some interesting designs on some of the doors. 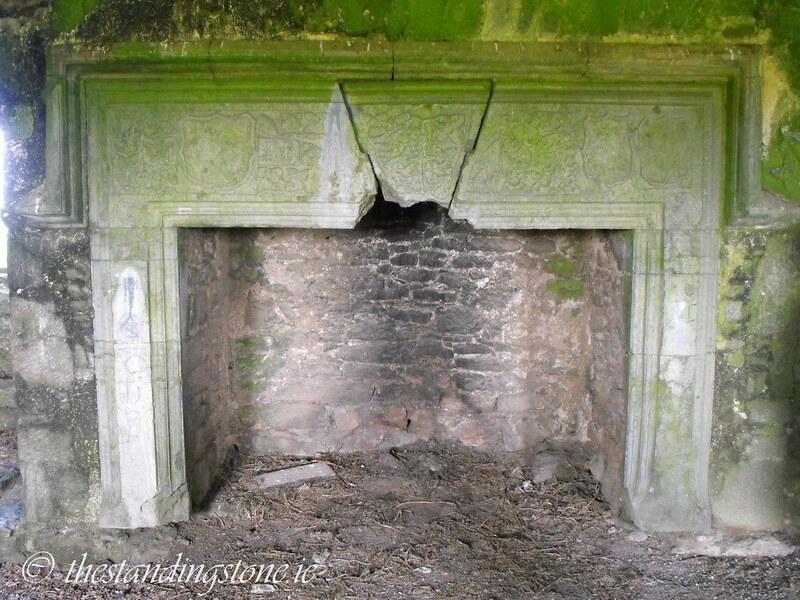 It is an absolute miracle that this fireplace has survived. It is really beautiful. 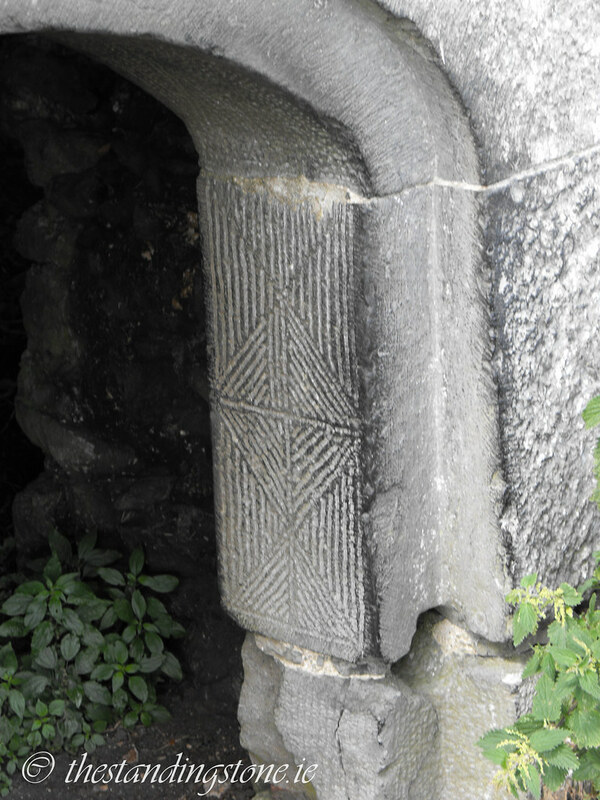 Detail of the fireplace with the initials 'FP'. On the top floor. I suspect that the fallen masonry has severely weakened the floor below and that it may not be far from collapse. The floor has a distinct hollow sound when walking across it. I would recommend caution while on that level. You can see hear that the windows were blocked up prior to the collapse of the floors in the fortified house section. There is no way to access these windows now. Hello, Interesting site. 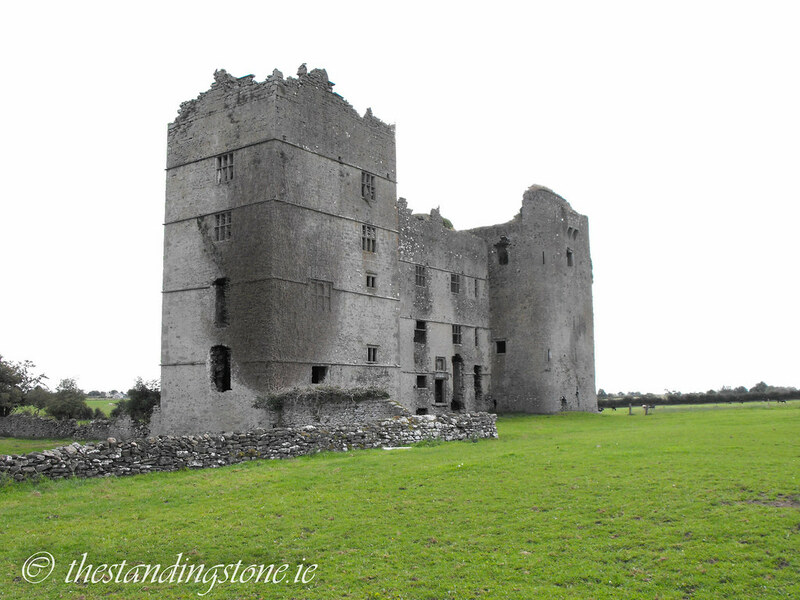 Loughmoe Castle is my family's ancestral home. The secret prison chamber does indeed exist within the tick walls, the entrance is located about halfway up the south wall on the top remaining story of the old tower. It is a very small prison although at a squeeze I imagine 3-4 people could have been locked within. Thanks for the info. I must go back to the site to see the prison. Have you been inside the prison? How hard is it to get in and out? Looks pretty darn interesting! Pity there's been no obvious effort to try and preserve it. Hi M Hynes. You are very lucky to have that castle in your family. I think the later house portion of the castle is beyond repair but the tower portion could be repaired and restored. When I went there the stairs were open but I did see that they were at one point blocked up. Knowing that the beautiful fireplace was on the first floor I couldn't resist going up. The first floor seems quite stable based on my experience with castles but the top floor did feel unsafe to me because of the fallen masonry. I do want to go back and find the prison but I think I should listen to my common sense and not venture ip to that top floor. I really think the OPW should make sure this castle doesn't fall down because it is so beautiful and so often visited. Hi. I am so happy to have found this site. 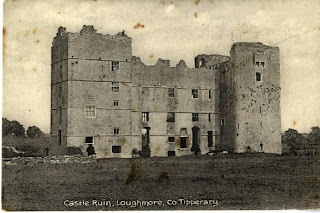 I've been researching my descendents from Cape Cod, Massachuttes and found that they immagrated from Tipperary many generations back and found information linking them to Loughmore Castle. I am so proud to carry the name Purcell and have this beautiful castle as part of my history! I plan on visiting the site in the future. I understnad that the castle itself is unstable in some areas. Are there any areas of the castle that are still stable enough to walk in? Hello WickedIrishPurcell, the newer part of the castle is the most unstable. All the floors are missing and it is just a shell of a castle. The original tower still has all floors in tact and you can get right to the top. The fireplace on the first floor is beautiful and very rare. It should be removed to a museum. However, no conservation work has been done so I cannot say how stable these floors are. On the top floor part of the wall has fallen in which may have weakened the floor. The site is on private land but the owner does let people in. But there's always the chance that he has cattle in the field and that you won't be able to get in. Hope that helps. If you want more info sent me an email via the contact me page. I had visited the castle many times the earliest visit was in 1975. I have some great pictures as well including one of my Dad & Mom in front of the fireplace that gives an idea of how large they were in those days. As well, my family is listed in Birkes Peerage which lists Purcells back in time. 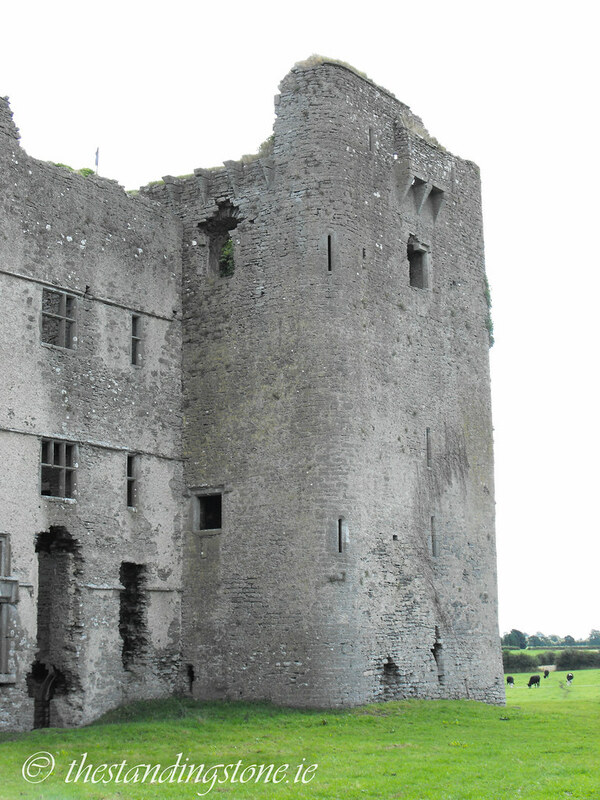 to madmac,ireland was looking into lough moe to preserve it.but there is something in the deed from nicholas purcell,that they had to cancel all plans to save the castle. Thanks for your comment 'anonymous'. I would love to know more about this deed if you have any more information. Please email with any info you have. Use the contact me tab in the left hand side menu near the top. It would be great to have the castle restored and im sure there are enough Purcells around the world that would be only too happy to contribute in some way towards the restoration. Our family moto is Conquer or Perish. Was wondering when the last residents left the castle and why was the castle abandoned? Hello, I am the great g. grand daughter of John Purcell who left Ireland in the early 19 century. Who found his home in Greenville NY bordering Pa. he said the "green" rolling land and forests reminded him of the old country. I believe he had 6 or 7 brothers who came with him to the US. All gone off in different directions. Its so lovely to see the Purcell castle. What did the coat of arms look like? the one we have is the Boar. I'd be interested in running it as some sort of family history/castle fundraising page. Anyone got any ideas? hello family and friends, I just wrote a huge comment of Purcell history and lost it! anyway i was brought up with my 5 siblings in the recent Purcell family home, Burton Park, Churchtown, Mallow, Co. Cork. I now live at Loughbeg (!) Farm, Schull, West Cork, Ireland. Our father inherited Burton from his Aunt Louisa Purcell, as her two brothers died, Charles Frances at The battle of the Somme, and Raymond (from wounds) in 1928. Other Purcell houses Altamira and Highfort (Liscarroll) and Curraghmount, Buttevant. 50 boxes of Purcell papers in Cork Archives. Also please google Sir John Purcell, the 'Knight of the Knife' who killed in self defense at Highfort. Please email me on wryanpurcell@eircom.net would love to hear from you. Love to all Purcells and friends around the World! Just came back from a week long trip to Ireland which included a visit to Loughmore. My sister met the owner, James McGrath, and he graciously gave us permisson to explore the castle. He let us drive up the gravel road to the bridge across the railroad tracks and we walked from there. Being a Purcell, this was a magical experience. 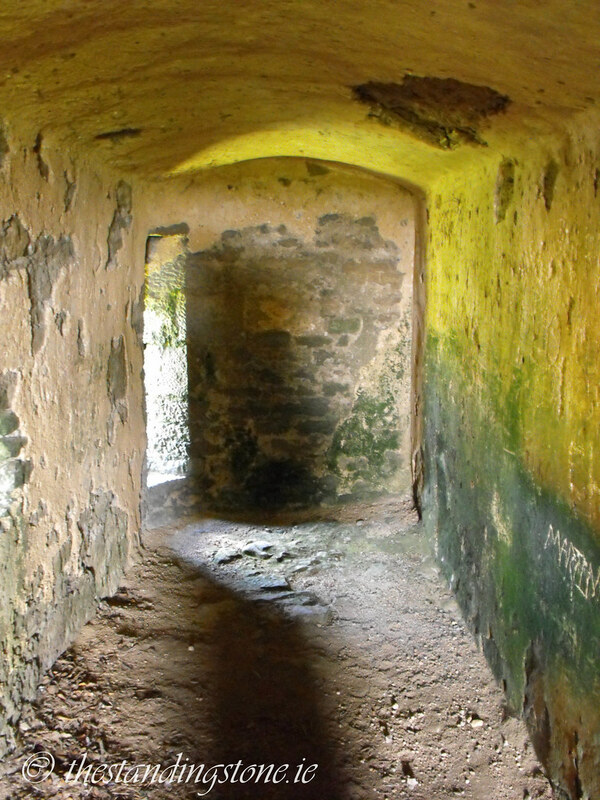 The Castle is in good shape, however, the staircase to reach the upper floors has been more successfully barricaded and we were unable to climb to the other floors. If you are in the area, definitely stop by, it is worth a look, as in the nearby church cemetary. Hello! 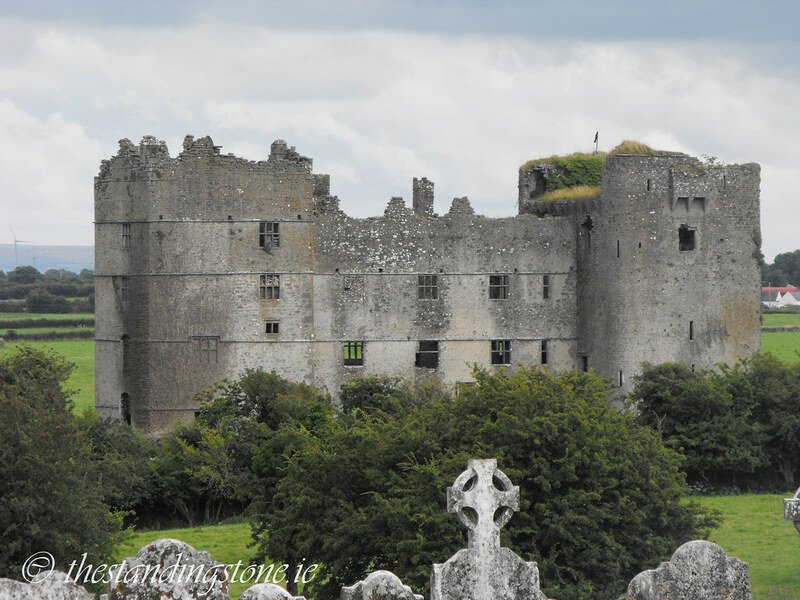 I traveled to Ireland this summer, and because of this site, looked for the castle. 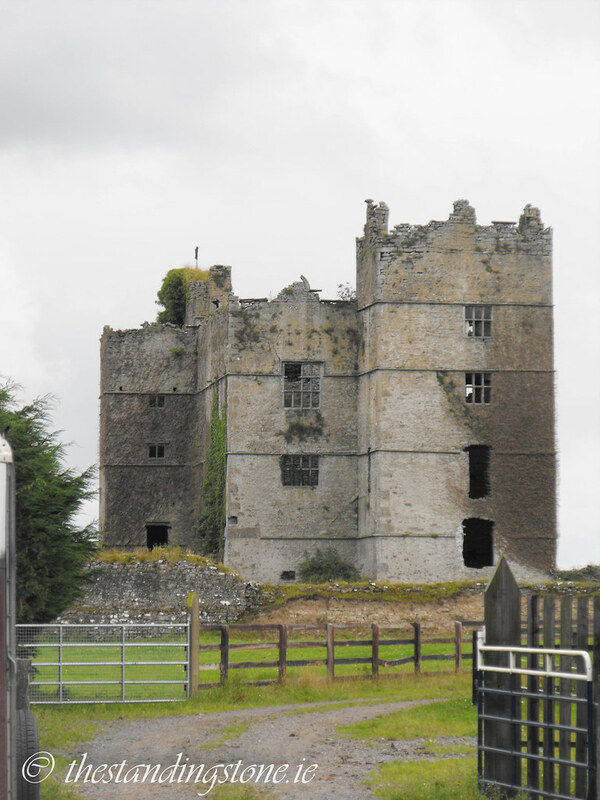 I stayed at a B&B the evening before, and the lovely host, Pierce Duggan, sent me to another Purcell castle near Thurles. His cousin lives next door. 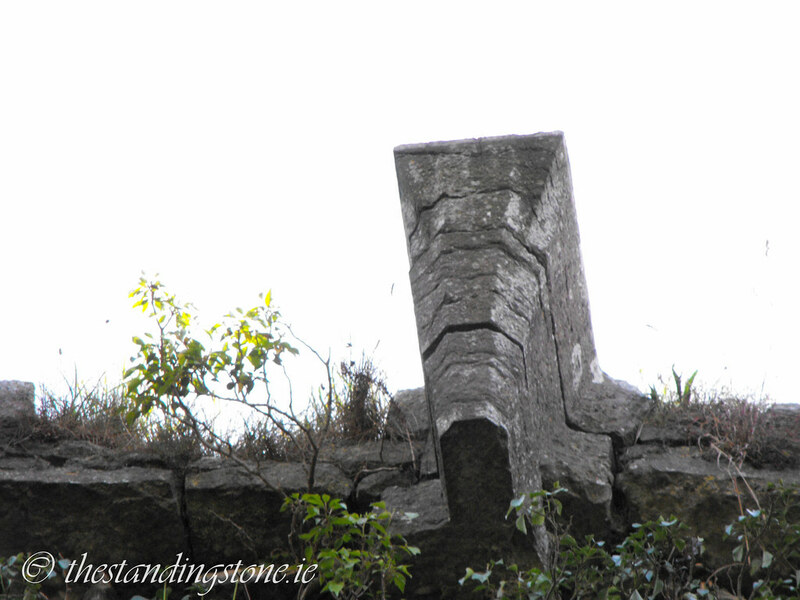 On the way, I saw a small sign for Loughmoe, and remembering this site, turned down the road. I went to the local tea shop, where everyone confirmed I was in the seat of the Purcells. I visited with James, the farmer who owns the land the castle is on, and he graciously allowed me to investigate. His horses were so friendly! The ladies at the tea shop sent me to see Monsignor Dooley, who truly is an expert in the history of the castle and the Purcell/Butler history - if you go, you must look him up! The castle was just amazing and so was the parish cemetery - don't miss it if you go to the castle. It's not too far of a drive to the other Purcell castle, in Ballycahill - a round castle tower, next door to Pierce's cousin. I'm doing my family genealogy, so, if you're a Purcell with American roots in Philadelphia, please contact me! 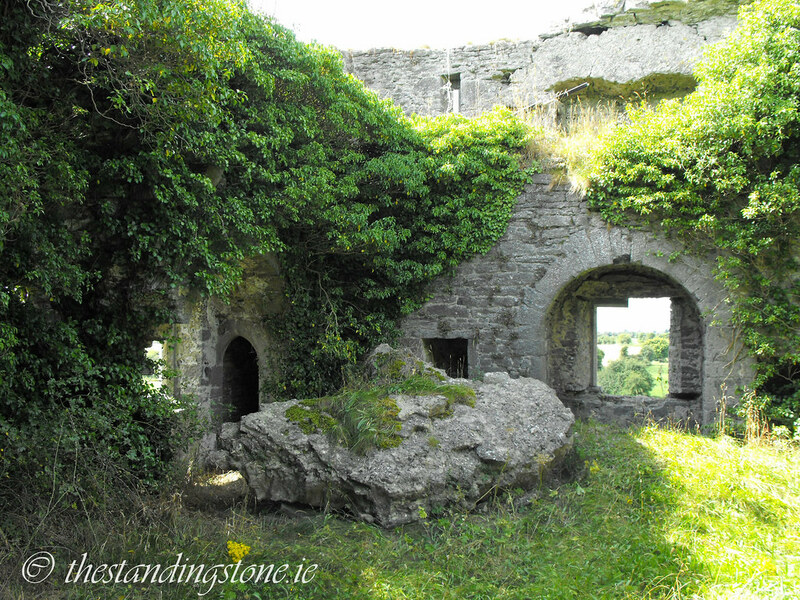 Hi, I am also a Purcell and was interested in visiting the ruins when I go to Ireland. Do you (or anyone) have any advice on if I could rent a bike in Templemore or the nearby village and ride out there? I checked distances and it would be a doable but long walk? It's a pity nobody's restored it, though. This is my familys ancestors and we are going to be visting this castle next summer! So surprising to see that we have lots of family history in Ireland! For anybody considering visiting the castle ruins nowadays I would say to exercise a degree of caution. I have seen the profile of the tops of the walls of the manor house change more in the last 2- years than in the previous 30+ years. This is probably for the best as when I last climbed to the top in 2012 (at this time somebody had pulled down the previous boarding) I didn't think what is the highest remaining floor was in great shape. It had subsided or dipped quite a lot since my last visit to that floor in 2009. I didn't deem it safe and actually didn't allow my wife to explore the top fully, so I just pointed out some of the interesting features and my childhood play areas !! The south wall of the southern tower has also moved a lot more in recent years than I ever noticed in the past, which ties in with my concerns about the top floor. A pity, because I always enjoyed spending some solitary time at the top of the castle, taking in the views and admiring nature, making the most of the uninterrupted quiet to gather thoughts and pass reflection on life. If you have an interest then ask the farm-owner, James McGrath, if you can visit, but I'd imagine he'll probably give you the same words about being cautious around the ruins. I'm planning to take my 80 yo father to Ireland this summer - he has never been. We are purcells and I thought he might like to at least see the castle, but wondering if there is anything else in the area that we should see or visit if we make the trip? I'm afraid I do not know the owner, nor do I have contact details for him/her. I have never heard of anyone being turned away, but the upper parts of the castle are now blocked off. thank you,, we will go in the hopes that the owner of the land will grant us access--- PEACE to all my Purcell family and may GOD bless you, your families, and your endeavors. I'm not sure if anyone will see this, but I am a Purcell that is a civil engineer with a focus in structural. I know it has been said before about restoring the castle. If the funding was there, I would gladly help by designing the restoration of the structure. Parts of my family have seen the castle and said how beautiful it was and that it was amazing to see part of our heritage. Hello from another Purcell. So interested in hearing from any of my ancestors who may still be in Ireland. My Great-Grandfather was Thomas Purcell. I am also a Purcell who lives in Pennsylvania, I am planning a trip to Ireland in the near future and cant wait to see the castle and would like to meet any Purcell family members in the area. Would you please share your history of the purcells and any pictures? I'm working on a family tree. I just found out from a Y-DNA test taken by my brother, David Purcell, that our Purcells came from Ireland. This is a dream come true for me and I am hoping that someday I can visit this castle and other areas in Ireland. I don't believe that descend from the Purcells of this castle because according to the test results I probably descend from the Clan of Carroll. Hi, I just found this site. My daughter is doing a family tree project. In doing research, I just found out this Castle was in my family. My great aunt Eleanor Purcell signed the property over before she passed away. I'm also a Purcell (great greart grandfathers down to my mother who was a Purcell). On a recent trip to Ireland we went to see my ancestral castle. Unfortunately, we were not able to get up close, but meandered around it for many good pictures. Does anyone know if any of our Purcell ancestors are buried in the small cemetery at the church grounds that overlook the castle? I'm in Boston. Hoping to return next year for a closer visit. 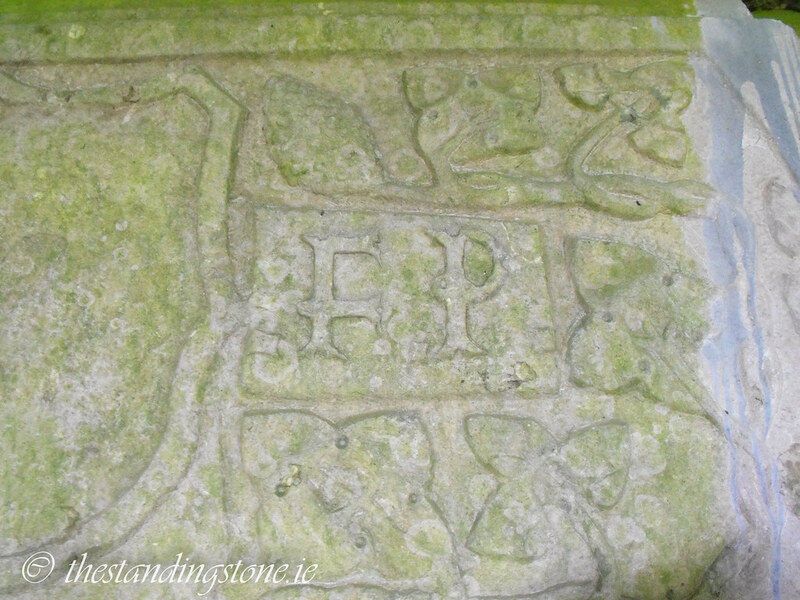 @ Susan -- There are many Purcell graves within the walls of the 'Old Abbey' i.e. 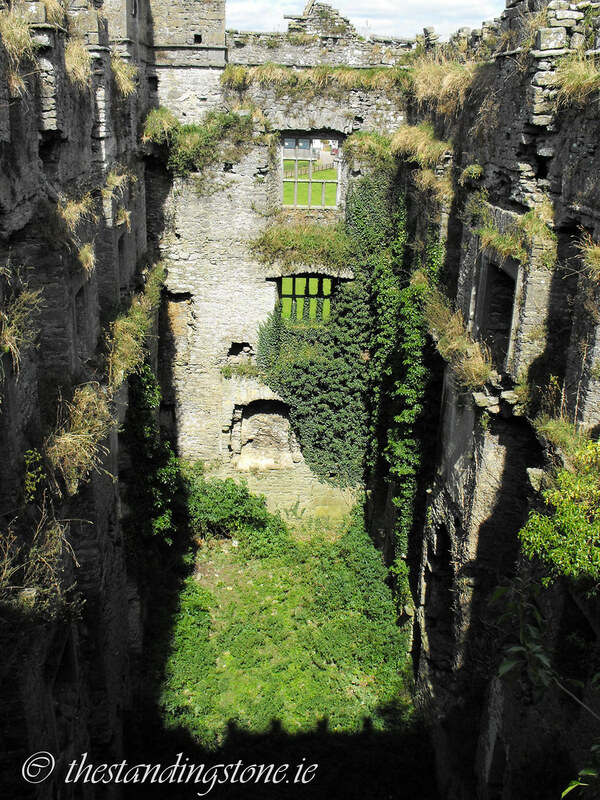 within the walls of the building ruins. There are also some in the graveyard surrounding the old abbey, but you need to know where to look. They are not easily identifiable anymore. I've photographed some, before weathering renders them unreadable. The graveyard around the newer church also has a number of Purcell graves. If anybody is interested I've begun mapping out a family tree of the Purcell family remaining in Loughmore, and would love to receive any info or hear from Purcells who may have a link to the area. During the 19th & early 20th centuries many Purcells from Loughmore moved to various parts of England, and to Missouri and Illinois in the US. I will be visiting Ireland soon and would like to see the castle. This castle is also my ancestral family castle on my Mom's side. Does anyone know how to get in touch with the owner of the castle? Best thing to do is check for activity in the farmyard, or ask in the coffee shop in the centre of the village when you arrive.